We are a small local domestic cleaning business based in Hatfield, South Hertfordshire and we are absolutely passionate about customer service. Our mission is to provide all our customers with a 5* cleaning service. You will be amazed at the quality of our service and the standard of cleaning we provide. Having been founded in 2010, we are well established in the local community and some of our original clients and our original cleaners are still with us! Our basic rate is £16.00 per hour (INC VAT- min 3 hours weekly). We know this is not the cheapest headline rate but we aim to provide a service level combined with a responsible and ethical approach that justifies this cost. We also promise to hold any rates quoted through to Jan 2020. Please do check out our google reviews in comparison with any of the local competition. We are also pleased to offer a thorough and professional carpet steam cleaning services. We don’t just give your house a cursory once-over. Every room is cleaned from top to bottom. We dust under all the furniture, and under every ornament. We sweep every corner, and polish every surface. Every tap is left gleaming, every cushion is plumped! We have been established for 8 years and have full public liability insurance. All of our cleaners are vetted and trained to our high standards. Some of both our cleaners and clients have been with us for many years. 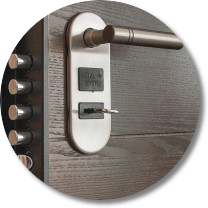 The security of your home is a priority and we leave your house tidy, clean and secured. If we hold keys we will replace the lock in the unlikely event that it is mislaid. As well as the normal room cleaning you would expect, we can also do more specialist jobs such as giving your kitchen a deep clean, do your laundry and ironing, steam cleaning carpets (extra charge), interior windows and more.Just ask us about any additional requirements. We also understand service means being flexible and maintaining effective communication. You may also notice that we are a company and we are VAT registered. Not a private individual or an agency. This means the cleaners work for us, we are paying our due tax and duties. 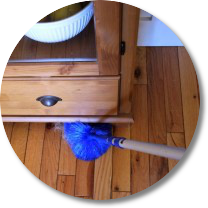 We take responsibility for the cleaning service provided and will work with you to solve any problems that may arise,. 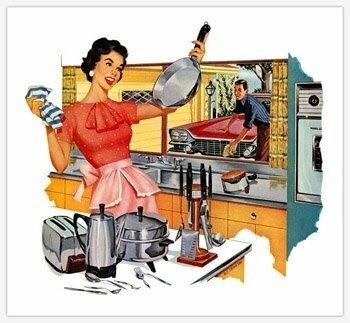 We also specialise in what we call “caring & cleaning” where we offer that little extra time and attention or service that might be needed (especially for older clients) and/or where clients are asking us to provide services for parents or relatives or just a property where they themselves might not be present locally. Please do contact us for a quotation to clean your home. We hope you enjoy our website ~ why not take a look at the range of services we offer and then get in touch to find out how we may be able to help you. We very much hope you will choose done and dusted. 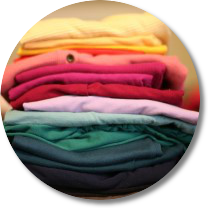 Before you move out of your rented accommodation you will need to return the property in a spotlessly clean state. 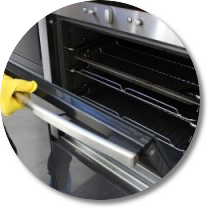 Our end of tenancy service includes cleaning the insides of cupboards, the oven & hood, white goods such as a fridge freezer & washing machine, interior windows & blinds, and steam cleaning of carpets. 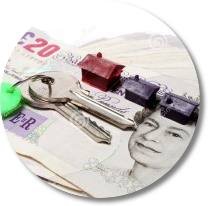 Most landlords will keep all or part of your deposit if they feel that they need to lay out any expenditure for cleaning or repairs. With our service you can rest assured that the cleanliness of the property will be spotless, so you can have peace of mind knowing that your landlord will be very happy with the state of the home after you leave. Welwyn Garden City (or WGC as it is commonly called), is a beautiful town in the county of Hertfordshire. It was founded a man named Sir Ebenezer Howard back in the 1920’s. 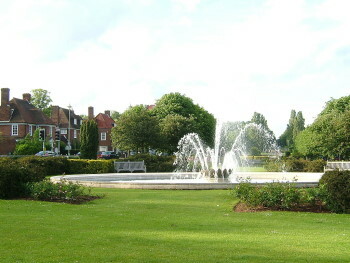 The fountain parkway pictured on the left dominates the town centre and forms a beautiful centerpiece for the town. Another area of more natural beauty is Stanborough Park which spans 126 acres of award winning lands. It is filled with many nature trails and orienteering walks and is very popular in the summer. Other attractions in Welwyn include the Maynard Gallery, the railway viaduct, several golf courses (where Nick Faldo used to practice in his early days!) and a comprehensive indoor shopping mall at the Howard Centre. This mall boats John Lewis, Marks & Spencer and Debenhams stores. We cover all the little villages and towns around the WGC area including Ayot St. Lawrence, Ayot St. Peter, Bayford, Bramfield, Brickendon, Childwick Green, Codicote, Digswell, Handside, Hertingfordbury, Kimpton, Lemsford, Little Berkhamsted, Mardley Heath, Old Hatfield, Panshanger, Sandridge, Tewin, Waterford, Welham Green, Wheathampstead and Woolmer Green.